McEvoy is triple majoring in German studies, international studies and history with a focus on world politics and diplomacy. He is a Jewish studies minor. He will be teaching English and American studies in a school in the German state of North-Rhine Westphalia September 2017 through June 2018. McEvoy is fluent in German and has worked as a drill instructor for German at the University of Richmond, which he says allowed him to help others learn the language. “While in Germany, I am also interested in exploring the possibility of pursuing an additional community engagement activity such as an internship that would allow me to work with newly resettled refugees,” McEvoy said. 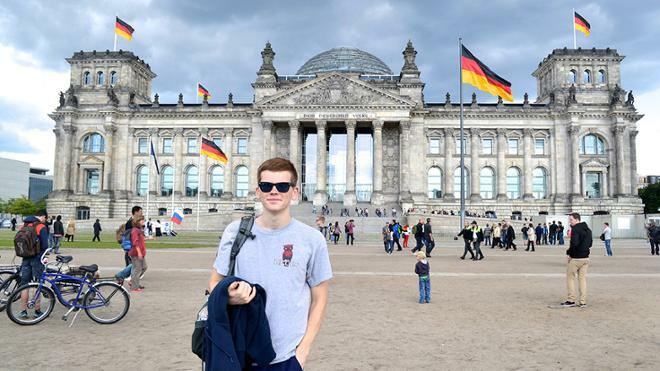 McEvoy has participated in multiple study abroad projects during his time at University of Richmond, including two summers in Berlin, and trips to Poland and Israel. He spent a semester abroad in Bangalore, India where completed coursework in, Indian culture and history, international development and elementary Hindi. “These opportunities have not only allowed me to sharpen my language skills, but also to develop the relevant cultural competency needed for successful in-country engagement,” said McEvoy. After returning from Germany, McEvoy plans to attend the University of Pennsylvania Law School. “A University of Richmond education promotes a willingness to learn about and become engaged with the world, as Ryan demonstrates,” Merritt added.